The Boilermakers continue to play early, but they also keep winning, as they beat the Fighting Illini 73-56 for their fourth straight win as they return home for their final two home games of the season. It wasn ' t the fireworks display we are accustomed to from Purdue's star Carsen Edwards, he had 23 points on 8 of 14 shooting including 2 of 5 from three, but coming off the last two games where he went 1-20 from three, the quiet efficiency was a welcomed change. 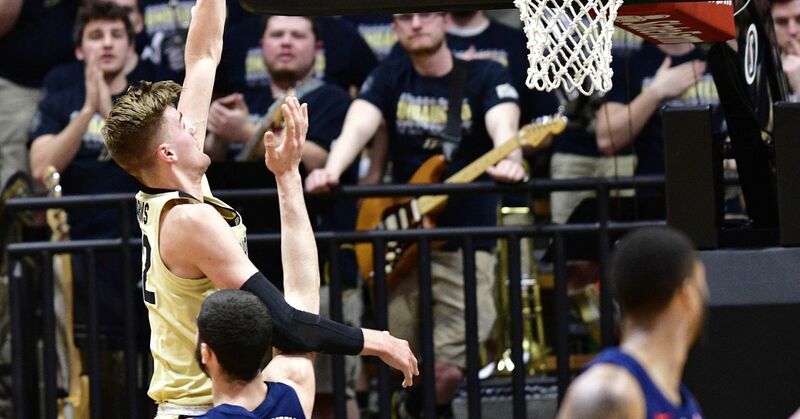 Matt Haarms continues his late season surge, as basketball tends to get uglier as teams eye the end of the season, the big man has found a rhythm battling Inside, defending the rim and scoring the basketball. He finished the game with a double-double, scoring 21 points and grabbing 10 boards, so he added 5 blocks. Ryan Cline had an off-night shooting, only scoring 2 points on just six shots but he contributed everywhere else. He grabbed 8 rebounds and led the team in assists with a season-high 7. It was Nojel Eastern that provided the early kick for a Boilermaker offense that struggled in the first half. He took advantage of his size and got to the hope at will against Illinois guards. He had 8 first half points, and kept attacking in the second, finishing the game with 14 points to go with 6 rebounds and 6 assists. Grady Eifert had 11 points, continuing to show off his long-range shot, 2 of his 3 three-pointers. With three games left, the reality is starting to set. The Boilers are just three games away from earning the school's 24th Big Ten Championship. They’ll play host to Ohio St. on Saturday before finishing the season on a two-game road trip. They'll travel to Minnesota and then finish the season playing at Northwestern. If they win their remaining three games, they'll do no worse than share the Big Ten championship with Michigan St. This win locks Purdue into a top-4 seed for the Big Ten Tournament. This guaranteed Purdue the important double-bye in Chicago in two weeks. Purdue will host Ohio St. Saturday, March 2nd at 2:00 pm.